I don’t know about you but I need to not be up to my ears in hard boiled eggs after Easter. I like them ok. But that’s just it. Hard boiled eggs are ok. Not fantastic. Not super fun. They just are. But I still want to dye eggs with my kids. 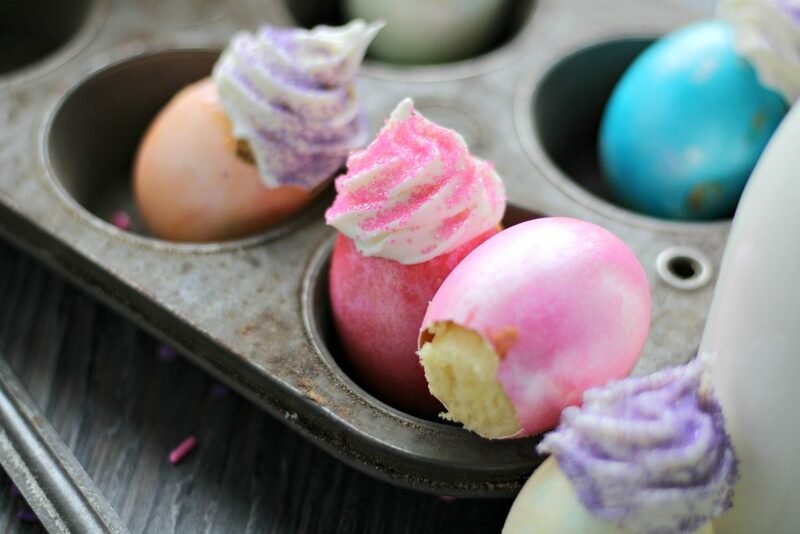 Well, hello, Easter egg cupcakes. 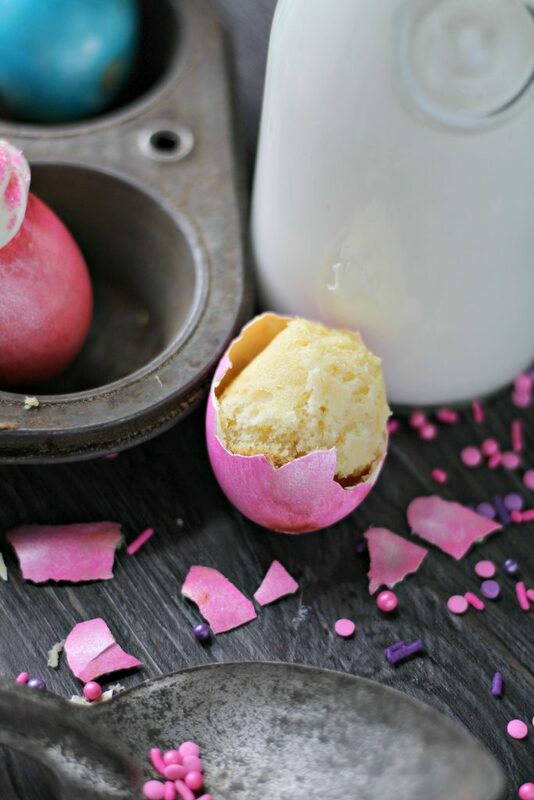 You get all the fun of Easter egg dying, without being up to your ears in hard boiled eggs. 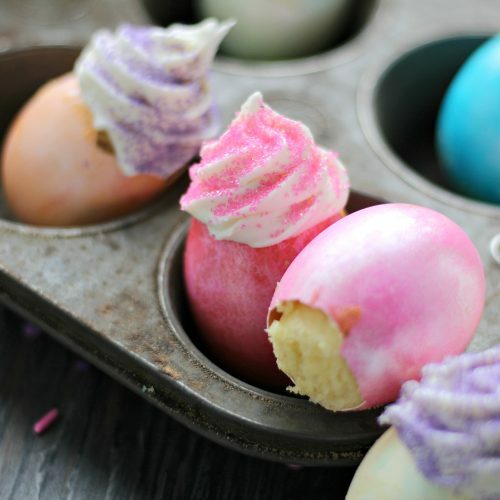 Instead, you get the most fun cupcakes out of the egg dying situation that you can put out for Easter dinner dessert. 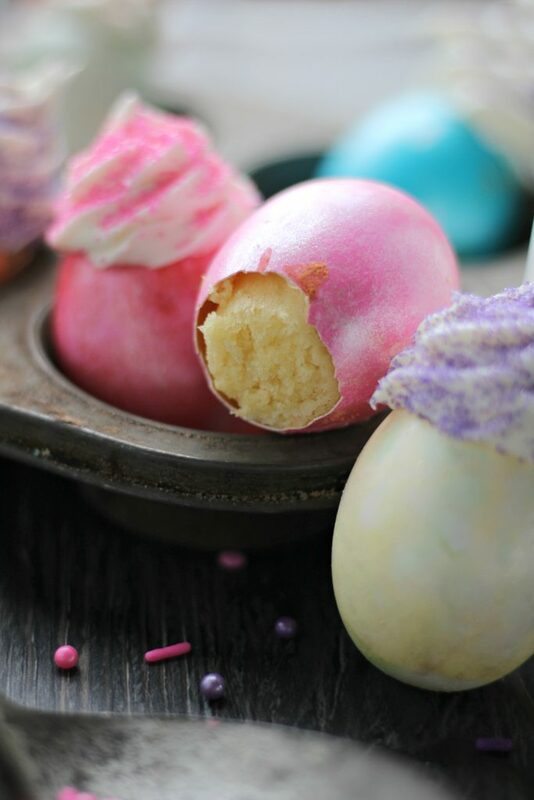 To make these Easter egg cupcakes, you start by dying raw eggs. 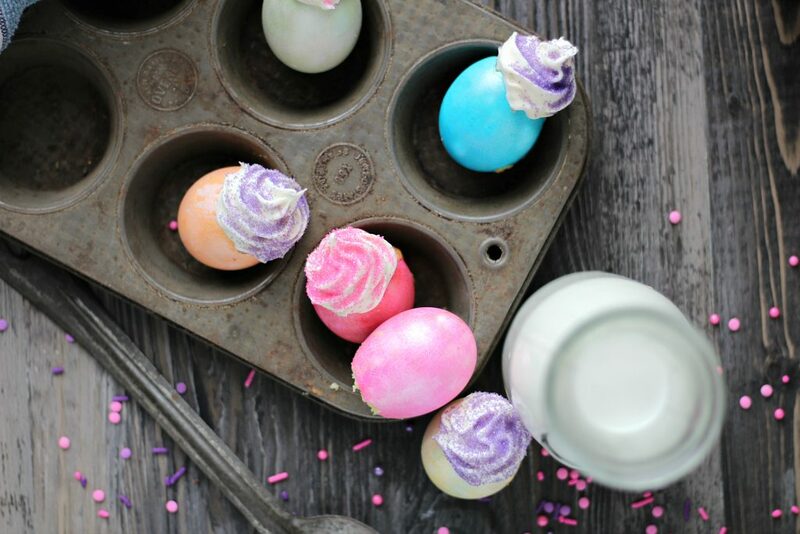 Just use your favorite Easter egg dye to dye the eggs like you would if you were dying hard boiled eggs with the kids. Then let the eggs dry. When the eggs are dry, carefully use a pin or tack to poke a hole in the top of the egg. Keep whittling away at the shells until there is a sizable hole. Pour the raw eggs out of each. Once you have holes in all the eggs and all the eggs cleaned out, place them in mini muffin tins with the hole side up. Then, mix up your cake batter. Use any kind of cake mix that you like. I chose yellow cake mix but chocolate or funfetti would also be good. Now it’s time to fill the eggs with the batter. If you use a funnel to fill the eggs, this step is not hard or messy at all. Just place the funnel in the hole in the egg and spoon a couple spoons of batter into the egg to fill it up half way. When you have batter halfway filling all the eggs, bake them at 350 for about 10 minutes. 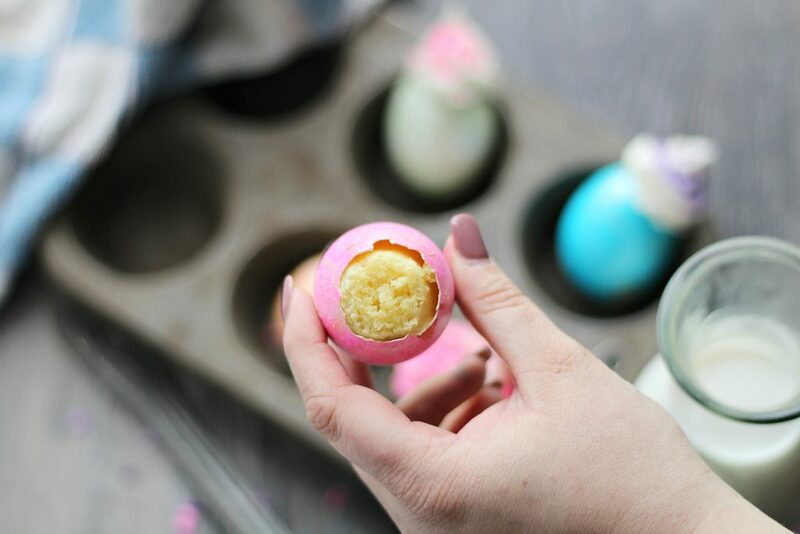 When you pull these Easter egg cupcakes out of the oven, let them cool and peel back a bit more of the egg shell to expose more of the cupcake. Then using a 1M tip, frost each cupcake with icing and decorate with pastel sprinkles. 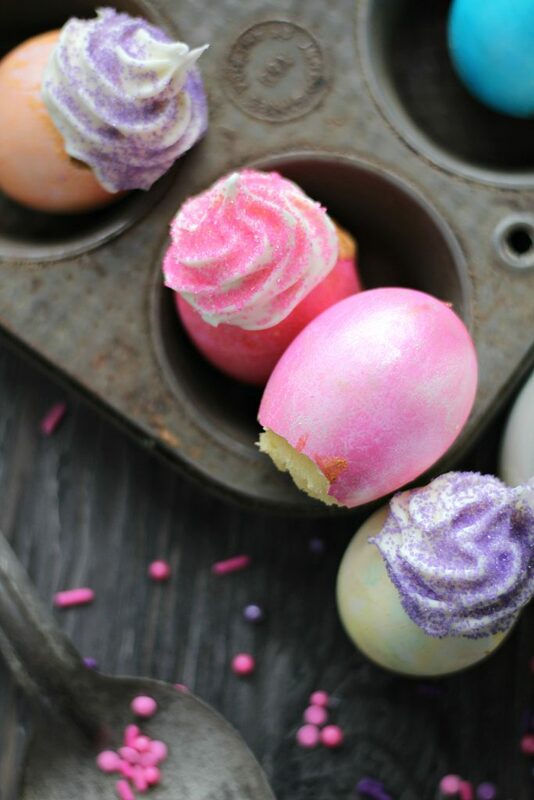 Then enjoy these sweet little Easter egg cupcakes! Start by preparing your Easter egg dye according to box instructions. Dye each egg desired colors and let dry completely. GENTLY poke a hole in the end of each egg. (I used a metal tac, and then gentle picked away at the shell until there was a hole large enough to place batter into. Place each egg into your mini baking tin, hole side facing up. Prepare cake batter according to box instructions. Using either a funnel (much easier) or a spoon, fill each egg shell up half way with batter. Bake at 350 degrees for about 10 minutes, or until toothpick comes out clean. Pick any excess cake off the outside of the egg shells, wipe clean with hands. Peal back 1/4 of the shell to expose the cupcake. Icing the top of each cupcake with your icing, piping bag, and 1M tip. How sweet and fun! Thank you for sharing at Fiesta Friday!